9/7/12 It was just as we had suspected. After watching the Murray final we now know for sure. You definitely do Kate from the front and take Pippa from behind. Take their photos! Oh for heaven sake! What is it with you? Now that is an interesting lineup to be referred to as ‘Rock’. Trade descriptions we think. We have heard the reaction of some crowds to some of our players around the world and it has not been pleasant. Central Europe does seem a particularly unpleasant part of the world. Which leaves us to wonder why Euro 2012 is being held there? Guess if you can take the Olympics to China though nothing much matters. Worth looking at 8:30. The final part of 7 Up as they are now 56 Up. Been interesting but I’m not sure we are any the wiser about what it is like to have lived here for the last 6 decades. UPDATE: Well the simple conclusion would seem to be that social mobilty is a total myth. Yep, the rich get richer and the poor get the blame. Chance to see a few more now they are 56 and what life has thrown their way. There is also a look how things are not quite in harmony when we look at the Eurovision song contest taking part in Azerbaijan. Who’d have thought? Only one thing worth watching but for us it has to be a must. 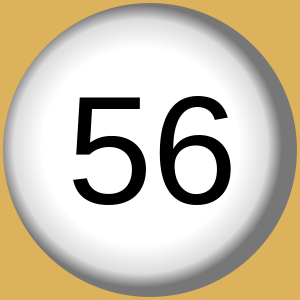 56 Up – part of the 7, 14, 21, 28, 35, 42 and 49 up series. First of three hours tonight. It has to be – the weather is Kat! It’s all about Manchester today. Sit back and see how it unfolds. 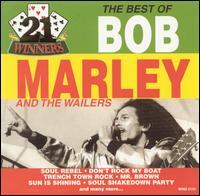 We’ve got The Onion Network and one little treat is a Bob and the Wailers music special. Starts off with Adrian Edmondson in the Dales continuing with his travels and revisiting some old friends. We can then have a look at Arsenal and see if Wigan can repeat the success they had over Manchester United. The crazy Onion News Network goes totally over the top at 9 o’clock and we can go to bed with the Sounds of the 70s. 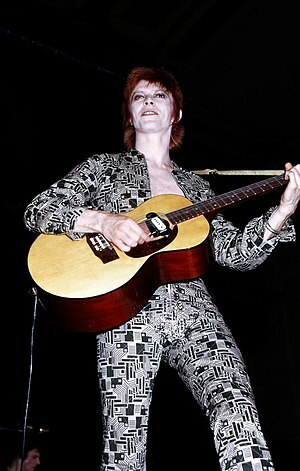 This includes a classic performance of The Jean Genie from 1973. Cooking, cooking, cooking! Give it a rest. Enough is certainly enough. Are those involved in TV so utterly devoid of new ideas? Well sack them then. All kicks-off with Blackburn and Manchester United. United looking to increase their lead after City only managed a draw on Saturday. Damien Hurst then appears to take us around the Tate Modern a retrospective of his work. We are not sure why anyone thought we would need Noel Fielding to get involved so let’s hope there is not too much of him. The Onion News Network follows with a look at how 24 Hour News could turn out. If the last week’s hysteria is anything to go by Sky News and BBC 24 are only around 4 months away from this vision. All ends with the final part of Spartacus: Vengeance. Lots of blood and gore to take off to bed – sleep well! All starts at about 5:30 with the first Test Match. Set the alarm for that one. Come the evening it’s Manchester United and Fulham. Along side the footie we have another evening with Matt Baker – oh great. Oh, what a great new series on the BBC. We are going to get some French cooking, again, yawn, yawn, yawn. Needs a ‘catch’ though so you will never guess what they’ve done – that’s it, they’ve gone to Paris to cook in a kitchen there. We would imagine that in these times of austerity they probably used a French film and sound crew. What do you think? I bet they all had a great time in Paris fannying about making a full 30 min of TV. What a bunch of wasters they are. Along the same line, isn’t it strange that Sky Sports have got the F1 series but somehow the same old smug BBC team had to go to Australia to ‘report’ on the race that Sky were going to give them the film of anyway. Over manning? Funny how it all works. Football with Arsenal and Newcastle, some crazy news with the Onion News network and then part seven of Spartacus: Vengeance. To be fair the BBC do have something on tonight. It looks like it’s one of their ‘we are going to make science interesting’ shows – like it isn’t interesting unless the BBC go to work on it. Very odd idea. It seems that one of the items has the team investigating ‘why petrol costs so much’. We reckon, without any real investigation or much research, that it is probably a lot to do with the 83p a litre in Tax that is slapped on it. That wouldn’t make a 30 min programme though would it? Poor night as usual apart from these two. We have to start to wonder if TV is really worth what they charge. Starting to have our doubts. We have the Twenty20 decider today, in many ways; some would say the tour decider. We have some landscapes to admire with an hour of David Hockney looking over Yorkshire. There is a new series of Onion News for those who can get it and then we can all go to bed after 75 min of blood and gore at the hands of Spartacus: Vengeance. Spartacus: Vengeance and a repeat of episode one of Homeland. Go for Tanglefoot but if that’s not available try Speckled Hen. Better do it before those thoughtful millionaires go and put the price up for the likes of the rest of us. 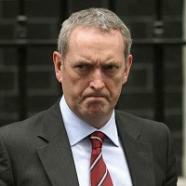 Why does that dreadful campbell keep turning up on the TV? Is he so universally loathed and mistrusted that he can’t get a proper job? Starting at 10:30, it is half-term after all, England try to claw back some pride in a One-Day-International against Pakistan. At least if we get stuffed here it’s over quickly. Dispatches looks at the sale of Olympic tickets and asks if it is going to be the debacle many suspect it will be. Seems the signs are not that promising. There is then the weird case of the 11 bodies that have turned up in Long Island over just two years. Need to do a bit of channel juggling as Spartacus is on at the same time but it will be worth it. A cold, wet Monday and all they can offer us is Liverpool v Spurs. If you don’t have Sky then you really are stuffed. 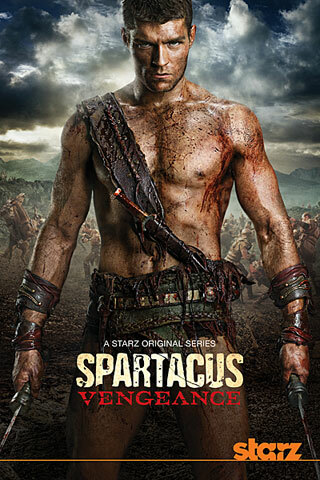 There is also the second part of Spartacus: Vengeance. Grrrr! Doot doot dooo… Life, oh life! Oh life! They don’t write them like that anymore (let’s hope). 30/1/12 Can it get any worse? Only two things on today and you’ll love them or hate them. 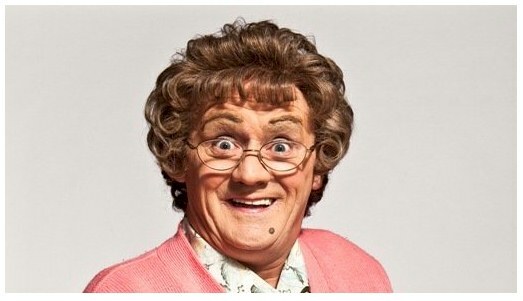 Mrs Brown’s Boys has another 30 min of madness and misunderstanding. She tries to prove she is not senile: that’ll take some doing. Then we’ve got the new series of Spartacus: Vengeance. Ten hours of loin cloths, scantily clothed women, rippling muscles and death at the end of a sword. We reckon students of History would be wise to avoid this wonderful rubbish. 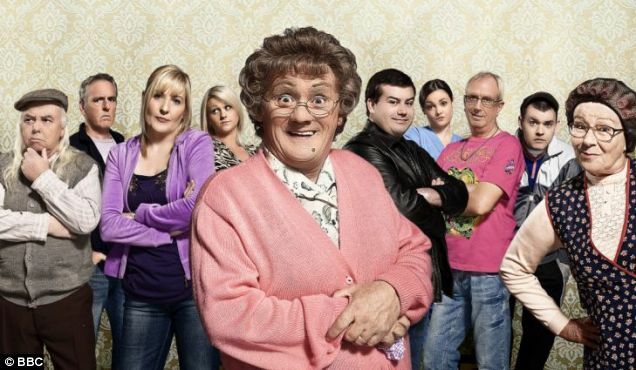 If you like it, and we do, there is some more madness from Mrs Brown’s Boys who decides to go on a bit of a health kick. We bet it can’t last. We’ve also got Leicester playing at Southampton and in the Africa Cup of Nations Morocco are playing Tunisia. One thing to listen out for is if Sache Tendalka gets his chance of a hundredth hundred with Australia playing India overnight. A thought about all that ‘lost’ revenue the music industry is always wittering on about. Seems they have forgotten the deals like when Robbie Williams got £80 million. Yes, that’s £80,000,000. Remind us, what has he done for that? Oh yes, FOUR albums: 2002–05: Escapology and Intensive Care followed by 2006–09: Rudebox and Reality Killed the Video Star. Is there biggest problem really people copying albums that one of them has bought? It’s been going on for years. We can remember recording radio shows onto cassettes – no one got paid royalties for those either. 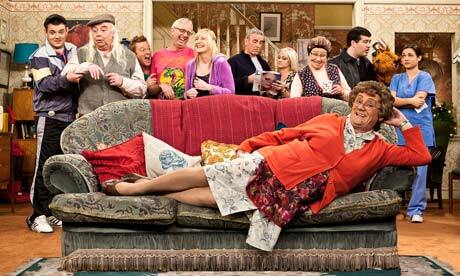 If you fancy a good moan then Richard Wilson On Hold could have you throwing things at the set. We at The Field have been trying to get some sense out of a firm that claims it talks a lot. Waste of our time. Wilson could open some old wounds. Anthony Bourdain goes to Louisiana for the last of the current series and Mrs Brown’s Boys has Mammy being as bonkers as ever. A nice little local derby sees Wigan taking on Manchester City. It seems The Bodyguard is STILL being shown. You have to admire the American TV networks who recognise when a show is bombing and just pull it. If only the BBC was that honest. 9/1/12 Why do we have to pay for a TV licence? 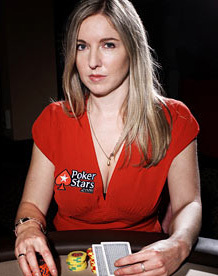 Arsenal verses Leeds in the FA cup and Victoria Coren can keep your brain ticking over with Only Connect. Which is more than the dreadful A Question of Taste will do – in a time of austerity did they think this was a ‘funny’ title? The one to give a very wide swerve to is the truly awful Royal Bodyguard. Why was this utter tosh even made? Including this one they have two hours of this dross to televise. Why? Answer us that, why? Just when we had all thought they had finally exhausted every element of cooking the BBC come with, wait for it, a Quiz!!!! They have even dragged Kirsty Wark into so as to give it an air of respectability. Why has she done it? The name could backfire on them: “A Question of Taste”. That has to be sailing close to the wind. Thank heavens we still have Anthony Bourdain on tonight. We also have ‘Count Arthur Strong’ at 10.30 pm on R4Extra. Having seen four of the political leaders New Years message along with one from the Church we have to ask- “Why do they bother?” It’s not like any of them have had an epiphany or anything. Just stating the bleeding obvious! Now the advert has finished we were left to wonder. Why exactly was Stacey Solomon ‘Driving home for CHRISTMAS’? What? The Sunday before Christmas and there was no BBC Sports Parade? We imagine they are so embarrassed about the Men Only Edition they’ve moved it to Thursday. We’d have given it to Great Britain triathlete Katie Hewison who was recently crowned Elite World Duathlon Championship at the championship race in Gijon, Northern Spain. And we bet you’ve never heard of her. Something on the Radio as telly is dire. 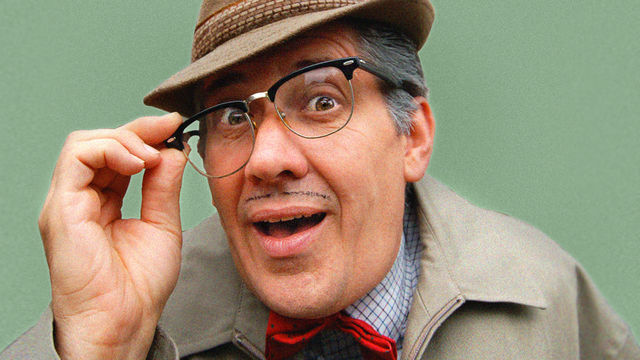 “Count Arthur Strong’s Christmas Special” is on at 09.00 and again at 22.30. It is bonkers. How many more poor old turkeys will have to suffer before we bring an end to this madness? It’s a turkey, you roast it. Simple. All these TV chefs you want to pass on their own secret tip for success on Christmas day. Give it a rest, please. 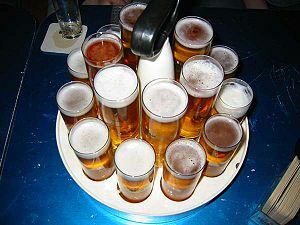 Chelsea and Man City provide the entertainment tonight. Still assessing the fall-out of the EU along with everyone else. What now? 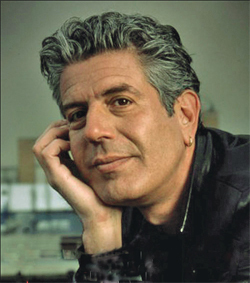 Anthony Bourdain and that really is about it! The Turner Prize is on but it can’t really be called entertainment of its self. Correction: As was pointed out by a number of Quiz contestants there was an error printed on Sunday. While the answer ‘a‘ –cat was the correct answer the reason given was slightly incorrect. While dogs do in fact lick each others arses when they meet, strictly (yawn!ff) speaking, BF merely licks his own arse. We are pleased to make this correction. So what Coalition job has John Hutton got his eye on? Was it Two-Jags who referred to him as the ‘Collaborator’? Two-Jags didn’t get a lot right but for once he might have been on the mark. Wonder what tax-payer funded pension Hutton is lined up for or actually on now? 28/11/11 Time to cut through the hypocrisy. Source: James Lyons, with thanks and full acknowledgement. THE Tory minister ruthlessly slashing the pensions of millions of public sector workers could be in line to pocket a £731,000 retirement pot. Francis Maude, 58, is among a number of Government ministers amassing vast, taxpayer-funded nest eggs. But while the millionaire can look forward to a potential £43,000-plus a year income in his old age, he is cutting schemes for nurses, teachers and public sector workers. The shocking sum is almost eight times the average £5,600 civil service employee’s pot. Union chiefs yesterday branded Cabinet Office Minister Mr Maude and his well-to-do colleagues shameless hypocrites. MPs can grow their pension pot by up to one 40th of their final salary – currently £65,738 – each year in return for putting in 11.9% of their wage packet. Veteran Tory Mr Maude, who is masterminding the showdown with unions, earns about £98,700. He will have chalked up (just:FF) 27 years as an MP and eight as a minister during two spells in Parliament if he keeps his job until the next election in 2015. If he paid in at this top rate he would get a pension over £60,000, according to Unite. Payouts are limited to two-thirds of an MP’s salary but it still means he could get £43,825. Contributing at the top rate, Mr Cameron – already worth an estimated £3million – would be entitled to £32,977 by 2015. His even richer sidekick George Osborne would get the same. It is almost six times the typical £5,600 public sector pension. Someone in a private scheme would have to save up more than half a million pounds. Deputy PM Nick Clegg could retire on £26,403 a year if he quits Parliament at the next election. Mr Alexander would get £26,403 while Business Secretary and Lib Dem Vince Cable would take home £39,551. Andrew Lansley, the Health Secretary busy demolishing the NHS, would pick up an identical amount if he opted for the top rate but a spokesman said last night he had chosen a lower one. (nice to be able to afford to: FF) Fellow Tory Eric Pickles, who has been inflicting brutal cuts on town halls across the country, could rack up £43,825. Anthony Bourdain is the only thing on worth watching. After all, it is Monday. Anthony Bourdain is off to Japan so that should offer some interesting dishes. A bit of war history pops-up with the story of Alan Turing. He was instrumental in breaking the Enigma Code but was never treated with the respect he deserved. Spurs are also playing The Villa and, on a number of fronts, it will be interesting if Ol’ ‘Arry is on the touch-line. The Leveson Inquiry into phone hacking steps up another gear without an end appearing anywhere in sight. Who knows what will be uncovered next? 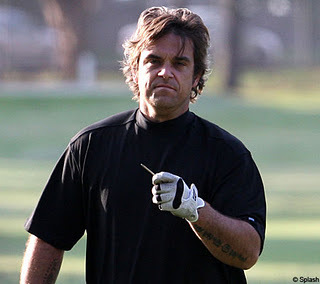 We also need to keep an eye on the RFU and hope they can decide on a coach we can all believe in. So, remind me again, just how much money did we, the tax payer, actually lose by the sale of Northern Rock? We certainly are ‘all in it’ on this one! Not too sure about Hugh F-W that he is convinced about the benefits of eating more vegetables. I just have this nagging thought. After he tried to get everyone to go organic the days of austerity have hit some people hard. Is he now trying to flog us a vegetarian cookbook? Just in time for Christmas! Surely not? 14/11/11 Not much on today. Anthony Bourdain at 19:00 and that’s about it. Cameroon (sic) tries to deflect attention on him by picking on under-funded schools. Septic Tanks get upset by the cuts in security cover they were first promised. Coe might need to put his hand in his pocket – those flying pigs would hurt him! Shaun Edwards stays with Wales. What on earth is the RFU doing? Stay with Johnson, an unproven coach and manager, and ignore a coaching genuis. Great move Andrews! Well done Mike T. Put it to them and tell them to stuff their request for you to pay a fine (for what?) right up their blind side wing. Loyd! Pass me the jar of Korma sauce. Ooops. Lady Gag Gag. Give it a rest love. Madonna did it all twenty years ago. 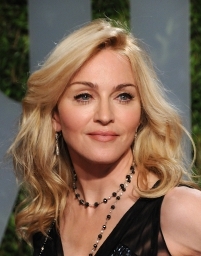 Of course, Gag-Gag has never heared of Madonna.